Be inspired by the highlights along the Grand Tour of Switzerland, including 11 UNESCO World Heritage Sites. The Grand Tour of Switzerland combines the best of the country in one route. 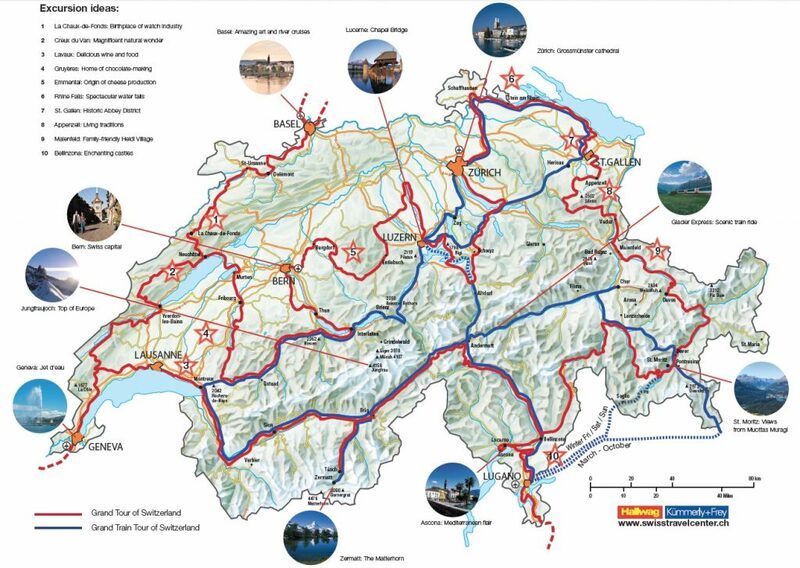 Discover the Grand Tour of Switzerland, an amazing new journey developed by Switzerland Tourism. Find below offers for the Grand Tour and the Grand Train Tour of Switzerland and click here for more information: The Grand Tour Factsheet (PDF). The Grand Train Tour of Switzerland comprises the most attractive panorama rail routes across the country. The Grand Tour also focuses on selected scenic excursion options and can be made at any time throughout the year. The Grand Tour of Switzerland is the world's first road trip for electric vehicles. A dense network with approx. 300 charging stations ensures power over the entire route and consequently guarantees comfortable and clean driving pleasure over 1600 km. The App Swiss Mag and free e-brochures on every aspect of the Grand Tour of Switzerland turn discovering the wonderful experiences along Tour into an experience in itself. Discover and enjoy Switzerland's exquisite panoramic routes in comfort on the Grand Train Tour of Switzerland. Explore the wealth of art, cuisine, architecture and savoir-vivre in Switzerland's cities on the Grand Tour of Switzerland.